This is the second in a series of blogposts, running from January through April 2019, that will be documenting the real-time development of a new course, CI (Cultural Identities) 250: Truth - Reconciliation - Story. For an overview of the course, go to jamesmskidmore.com/ci250. All posts in this series will marked by the tag ci250. ﻿We think of learning as acquisition: “Look! A piece of information! Let me acquire it (ie, let me learn it) and make it my own!” I encourage students to move beyond this rather limited view and instead approach learning as an exercise in categorization. These pieces of information are fine by themselves, but it’s when we put them into a relationship with other pieces of information that knowledge begins to take shape. And what is a textbook, or any non-fiction treatment of a particular topic, but simply a method of organizing information for readers/learners to learn, to gain knowledge? There’s nothing revolutionary or even all that insightful in making this claim. Yet one of the reasons I’m happy to be working with students on creating a textbook for this course is that by contributing to the development of the textbook, students have an opportunity to step back and consider the issues and complexities that accompany the categorization of information. We put this into action as we discussed how to organize the course textbook (an open textbook, built on the Pressbooks platform provided by eCampusOntario). We’re at the beginning of the course, and a lot of us are new to the material we’re studying and the way we’re studying it. 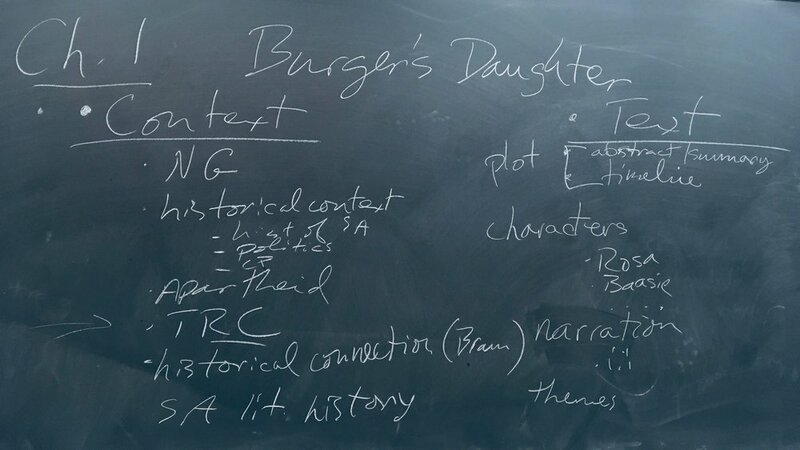 When I asked the students, therefore, how we should organize the chapter on Nadine Gordimer and Burger’s Daughter, I didn’t expect them to have ready answers about what the chapter’s topics or headings should be. I thought the discussion was nevertheless quite good because together we wrestled with the information we need to assemble and where it should go. In the end we arrived at two major sections: Context (all the background information that might be useful to understanding the novel) and Text (all the information we gather from the novel itself). The mad scribbling of Prof. Skidmore. The Context section came more easily to us; students had a good sense of what some of the major topics are when it comes to forming the background information for a novel. The Text section was harder. We’d sometimes get off track; if someone said we should have a section on characters, another student started talking about a particular character’s traits, and then all sorts of comments were made. It also became clear that students weren’t satisfied with just providing the literary analytical framework; they wanted to jump right into interpretation. That’s when my organization alarm bells start ringing: let’s take it slowly, one step at a time, no need to rush . . . . . Anyway, I’ve come up with following provisional outline of the chapter, parts of which I’ll fill in over the next few days, and on which students will have an opportunity to comment. One student pointed out that visual images would be important additions to the textbook, and I couldn’t agree more. I think that hunting down open or copyright-free images related to the course content will be a useful exercise. The discussion we had in class about the textbook structure was quite good. A little unusual for the students, perhaps, as they might have expected me to be driving the learning agenda more forcefully. But I hope it gave them a moment to reflect more critically on how we organize ideas - and how we learn.